The 2017 Internship Newsletter is now available on Pre-Law Advising Service’s Compass page. Please visit our Compass page to begin combing through the newsletter for summer opportunities that interest you. If you are a designated pre-law student, simply log in with your credentials to access the page. If you are not a designated pre-law student but would like to access the newsletter, please follow the instructions here. Positions are available throughout Illinois, Washington D.C., St. Louis, Indianapolis, and other cities across the country. Many positions have due dates over break and in early January, so we encourage you to begin working on applications as soon as possible. There are internship listings for criminal law, environmental law, labor and employment law, intellectual property law, state and federal government work, and full time job opportunities for December and May graduates. Make use of your long winter break to begin planning for summer: update your resume, create cover letters, and make sure to pay attention to the job postings’ deadlines. The time to apply is now! The internship newsletter also has opportunities posted for December 2017 and May 2018 graduating seniors. December 2017 graduates – make sure you visit our blog post from last week about current job openings for you. For anyone who has not applied to their prospective schools yet and wishes to start in fall 2018, FINISH YOUR APPLICATIONS! The time to submit is now! For those of you who plan on applying to law school in Fall 2019, winter break is a great time to begin preparing for the LSAT. 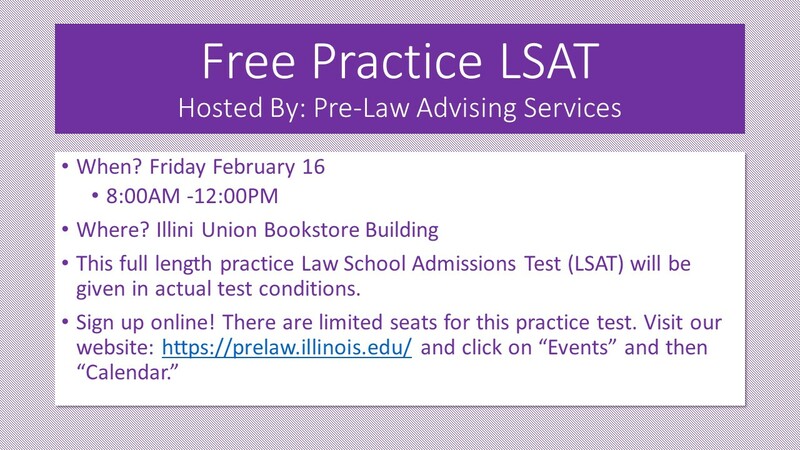 Over winter break, try to take a practice LSAT to see where your strengths and weaknesses lie. We’ve posted one over on our Compass page too. You can never start studying too early! 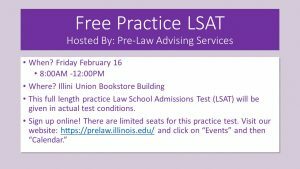 Additionally, this will provide you with some perspective that will help you gauge which LSAT prep company is the best for you at the 2018 LSAT Prep Fair on Tuesday February 6, from 4:00-6:00 pm in Illini Union Rooms B & C.
Save the Date for these Spring Semester events! This full length practice LSAT will be given in actual test conditions. As we have previously mentioned, several law schools have begun accepting either the GRE or the LSAT from law school applicants. This week, two more law schools, Brooklyn Law School and George Washington University Law School, announced that they, too, would accept the GRE, bringing the number to 15 law schools that will begin accepting the GRE now or next year. Educational Testing Service (ETS), the entity that administers the GRE, has posted the current list on its website. It is important to remember that the LSAT is still the most widely-accepted standardized test by U.S. law schools. We strongly encourage you to visit each law school’s website to understand the requirements for selecting the GRE in lieu of the LSAT. Note: This situation is in a state of flux. The American Bar Association, the entity that oversees the accreditation of law schools in the United States, is currently reviewing whether the GRE is an appropriate evaluation tool for law school applicants. This means things could change. Stay tuned! December is here and the LSAT is over, which means it is time to focus on the remaining elements of your application so that you can get those applications out as soon as your LSAT score is available in the first week of January. What should you be doing now? Check on your letters of recommendation…NOW!! Your recommendations should already be in your LSAC account. Check your account and follow up with your recommenders ASAP if they aren’t, so that you know when they will be in. Remember that your application is not complete and will not be considered without them. This should be your top priority because the closer we get to break, the busier professors get (or they begin to travel and be unreachable). Draft your personal statement. It’s time to take that energy and time you were focusing on the LSAT and devote it to your personal statement. Although our personal statement workshops are over, we have some tips and suggestions for the personal statement on our website and a helpful video and handout on our Compass page. You can also get help through the Writer’s Workshop, which is a great place to start. Spend some time thinking about your values, your career goals, and what makes you stand out from the crowd. Then write a draft, set it aside for a few days, and revisit it. Don’t worry if you don’t love the first draft–no one does. Start now so that you can spend at least a few weeks thinking, writing, and editing. Schedule an appointment now. When you are ready for some feedback, you can make an appointment for a Pre-Law Advisor to review your personal statement and discuss it with you in addition to answering any questions about the application process. December appointments: Both Pre-Law Advisors will be available for appointments through December 22, and we expect to be very busy with appointments during this time given that applications are up this year. It is a good idea to schedule your appointment now by calling 333-9669. Please email us your statement and resume two business days prior to your appointment so that we have time to review them. Winter break appointments: The office will be closed Dec. 25 through January 1. Appointments will be available again starting January 2. If you are not in the Champaign-Urbana area, you can make a phone appointment–just let the receptionist know when you schedule that it will be a phone appointment. Order your transcripts. You’ll need to order a transcript from each undergraduate institution you attended. At Illinois, you can check the “hold for fall grades” box to have your Fall 2017 grades included. Visit the LSAC here, http://www.lsac.org/jd/applying-to-law-school/cas/requesting-transcripts, for more information on the transcript ordering process. You can order your Illinois transcript through the Registrar’s website here. Schedule law school visits. Many law schools offer open houses. Check your top 3-5 law schools’ websites and social media. Individual law school visits are a good alternative. Call the law school and ask for a tour and to sit it on a class. 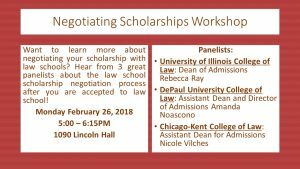 Visiting a law school is very important to your overall law school choice, and is a MUST for schools that you are seriously considering. Plus, law schools will note your visit and you may even get to meet the person reading your application, so be sure to make a good impression. Take a look at our earlier post called “The Application Process: LSAC Tips” for even more application details. As we noted in last week’s post, the PLAS Fall Events Calendar is complete. We will resume our programing in January, beginning with our Pre-Law 101 Workshop on Monday, January 29, followed by the LSAT Test Prep Fair on Tuesday, February 6. In the meantime, stay tuned for our Annual Internship Newsletter, which will be posted NEXT WEEK! This resource will contain over 15 pages of suggestions, ideas and actual internships for Summer 2018. Note – winter break is the best time to apply for summer internships as many of these opportunities have January application deadlines. This is also a great time to work on applications for scholarships such as the Boren, Beinecke, Udall or the summer UK Fulbright. Scroll down for more info! Winter break is a great time to work on scholarship applications like the Boren ($20K for lang. study – Jr/Sr), Beinecke ($34K for grad. programs in arts, humanities/social studies – Jr), or Udall ($7K towards environmental studies -Soph-Jr). Schedule an appointment with David or Jeff before you leave campus so you have everything you need. 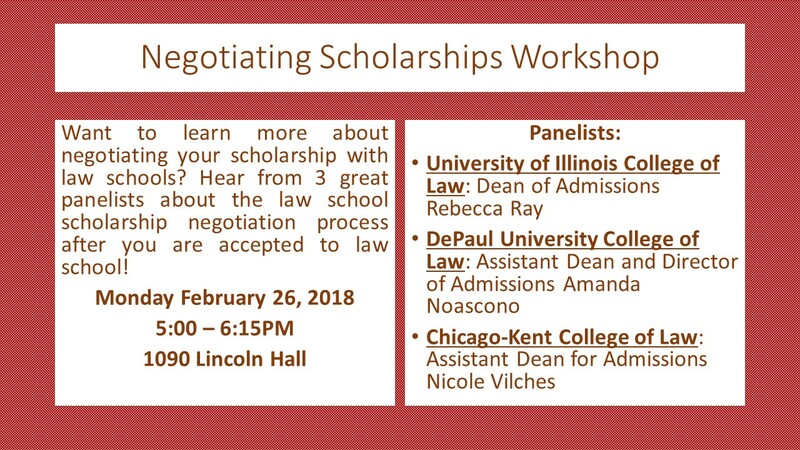 Call: 217 333-4710 or email: topscholarsh@illinois.edu. We are open for appointments Dec. 4-8 from 8:30-5:00 pm. The Fulbright UK Summer Institutes are three-to-four week programs for US Fresh-Soph students who have not yet traveled outside the US. All expenses paid by the Fulbright program and the application is short! Participants explore the culture, heritage, and history of the UK while experiencing higher education at a UK university. Come to an info session to learn how to apply and meet a U of I student who recently won this award. Friday, Dec. 8th 3:30-4:30 pm Rm 514 Illini Union Bookstore Building.